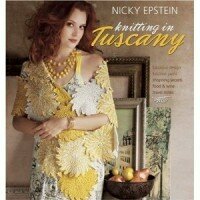 A bestselling author and a prolific knitwear designer, Nicky Epstein is known all around the world for her distinctive and creative style. In her many (more than 20) books and numerous articles and designs in all major publications Nicky is giving us a volume of information about innovative techniques and new ways to use some well-known even traditional stitch patterns. It takes a uniquely creative mind to see ordinary things and interpret them into a fashion statement. No matter what Nicky’s creation is, you can be sure that it will be in her beloved-by-her-fans whimsical style. She draws her inspiration from everywhere she looks. Nothing goes unnoticed and later shows up in her designs. Embellishment and detail are the two most important components of who Nicky Epstein is as a designer. Such books as Knitting on the Edge, Knitting Over the Edge, Knitted Embelishments are a great source for anyone who wants to design and experiment with adding adornments to their knitted projects. 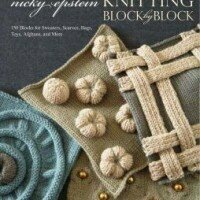 In her latest book Knitting Block by Block Nicky offers 150 “blocks” and shows how you can use them to construct a garment. To learn more about Nicky, her teaching and travel class schedule go to her new website and blog. Despite of her very busy professional life, Nicky stays upbeat and full of energy, and she always finds the time for her students and fans. She welcomes any interaction with other designers and teachers in the industry. I am sure that she will continue to surprise us with her new designs and new directions in her search for the unknown in the knitting and crochet world. 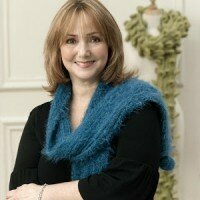 Below are Nicky’s answers to The Designer’s Studio questions and some photographs of Nicky from her workshops. Enjoy. When I was 6 or 7 my grandmother taught me the basics of knitting and when I was 14 a Spanish lady neighbor taught me detailed knitting and finishing. In 1982 after I won a McCall’s magazine sweater design contest—I started getting calls from needlecraft magazines. I love all knitting techniques and try to show that in my books. When I was younger I used a lot of intarsia and color work…today I like appliqué because it looks intricate and complicated, but is actually quite easy. 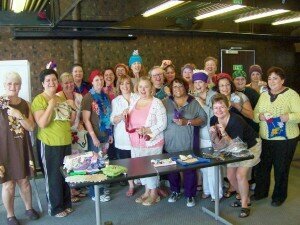 Knitters…don’t be intimidated by it. It really is different every time, depending on so many things… who the piece is for…the demographic I’m aiming for…the yarns I’m using etc. The inspiration comes from everywhere. 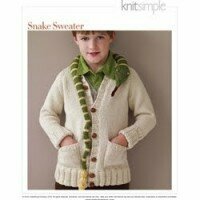 Knit Simple Magazine asked me to design an unusual boy’s sweater…I happened to see a magazine ad with a bare chested little boy with a pet snake around his neck and that prompted me to design a cardigan with a dimensional snake around the neck (my 5 year old nephew Mason wears it now and loves it). 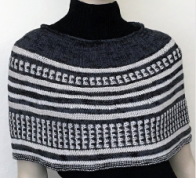 like a caplet inspired by Tuscan cypress trees and a sweater inspired by an actual and beautiful Etruscan Fresco found in a ancient ruin. Oh boy! It is overloaded with tons of yarn, needles, color cards, reference materials, a sheep collection, my books, etc…etc. My husband calls it the “wool warehouse”. On my couch in front of my large TV screen, with some chocolate nearby, in case I need some nutritional inspiration. Sadly, I don’t have the time, and my apartment is a little small to keep my own sheep, but I do like the thought of it. 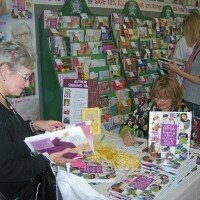 I belong to the Big Apple Knitting Guild in NYC and make myself available to knitting groups around the country that invite me to teach or sign books, I love knitting groups! 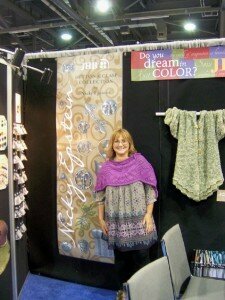 I have a number of designer friends that I see at various knitting shows. 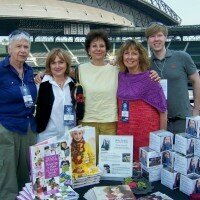 I am constantly in touch with knitters around the world through my website nickyepstein.com, Facebook, Twitter, Ravelry, and up close and personal teaching classes, book signings, and knitting cruises and trips. 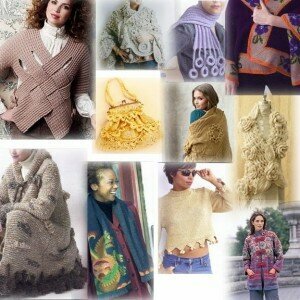 I feel it’s important to to stay in touch with people that are knitting my designs and get their input of my work. I’ve written more than 21 books that are available in yarn shops, Barnes & Noble, Amazon etc., and in all the major needlecraft publications, and I have many designs on my website, and will be adding more every month. When my book deadlines allow me time, I teach quite a lot. I’ve taught all across the country, in England, Australia, Italy, the Caribbean, Argentina, Uruguay. Canada, Holland, etc. See my website nickyepstein.com for my teaching/tour schedule. Do not be afraid! I pride myself on the fact that I create designs that may look complicated but are not. When I teach, my students are amazed how simple many of the projects are. I design garments that are knitter friendly, and put much thought into ones that will flatter almost any figure. I am working on new books and getting my website up to speed with its store carrying my patterns, buttons, clasps, scarves, books, note cards, artwork etc. My latest book “Knitting Block by Block” (Potter Craft/Random House Nov 9 2010 still has my head spinning with ideas for designing with blocks. I just finished a coat/jacket in coral red using Karabella’s new “Aurora Bulky” yarn and a kimono style cardigan using Cascade yarn. I love knitting and love to encourage knitters/crocheters everywhere to continue to enjoy the art/craft that brings us all such pleasure. Knitting should be fun. Happy Knitting! FG: Nicky, I can’t thank you enough for answering my questions in the midst of all you do. I love your new website and blog. There are so many beautiful photos of your designs and travel! 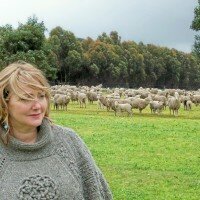 I hope our readers will take time to visit you there and learn how the yarn is made at the yarn mills and what tours knitters can take with you. Thank you, again.